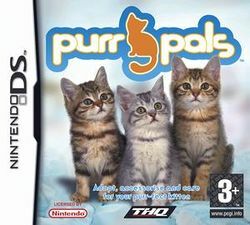 Purr Pals is a pet simulation game created by Brain Toys for the Wii and Nintendo DS. The object of the game is to look after up to five cats, and you can play with them, pet them, feed them, groom them and enter them in contests. It is often compared to Nintendogs. In the game there are four pet shops and four minigames you can play to win money. There are also four rooms your kitten can go into either by itself, automatically, or by being carried there. You can choose what your kittens accessories look like (you can buy new ones from the shop) and even dress them up with collars, hats, and even nosewear! Every day you get allowance based on how well you are looking after your kitten. If your kitten is (for example) hungry, you will get a feedig penalty, and loose some of your allowance. The base allowance with no penalties or extras is $5. You get extra money for taking good care of your kitten. This page was last edited on 11 February 2009, at 23:50.